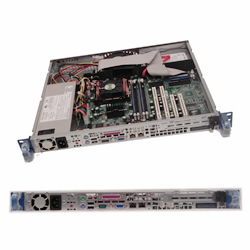 Acme FA1426-C32 back-to-back 0.5U Front Access server. AMD Opteron 4200 with 1U 14 inch rackmount. Back to back installation double rack space. * Easy setup, easy maintain, save cost and double standard 19" rack space. ** all connectors (included power cord, slot) are accessible from front panel, airflow is from rear to front direction. Up to 64B of DDR3 memory. option one PCI-e x8 slot. Front Access 1U RackMount case with 260W power supply, 2 of 3.5" HDD bays, big blower fan. CPU cooling kit included. Width: 16.7 in. Height: 1.7 in. Depth: 14 in. - Front access I/O connectors: 2 RJ45 Gigabit Ethernet, VGA, Serial port, parallel port, 2 USB2.0, keyboard, mouse, power, PCI-E slot.